I will be re-blogging entries of Blogathons I’ve officially joined in order to promote them ahead of the event. I will be prepping for is this one shortly, so please excuse missed days between now and then. We are so excited, we can hardly contain ourselves – and for Two Big Reasons! 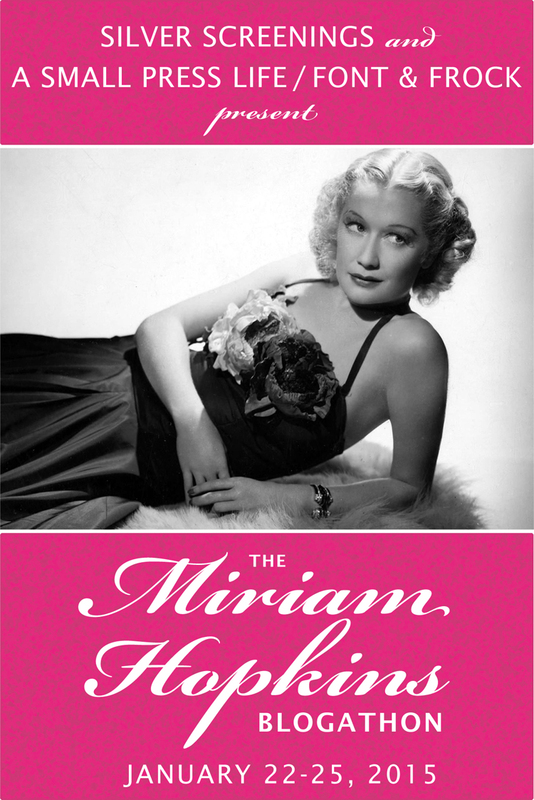 Firstly, you’re invited to help us celebrate one of the most remarkable actresses in Classic Hollywood: the fabulous Miriam Hopkins. The blogathon will run January 22-25, 2015, and we’d love to have you join us. Secondly, we’re excited to be co-hosting this event with our über-chic friend Maedez of A Small Press Life. But that ain’t the half of it! This blogathon with correspond with the launch of her new movie blog, Font and Frock, in January, 2015.
Who says January is a dreary month? You can write on any movie or subject associated with our Miriam, including her life, on/off-screen rivalries, or movies. You can sign up in the comments below, or email yours truly at 925screenings [at] gmail [dot] com or Maedez at onetrackmuse [at] gmail [dot] com. Thanks for helping us promote Ms Miriam’s blogathon. Looking forward to your sage vs. movie comparisons of “The Children’s Hour”.